I really like Vallum Killometer. . A 1 RotV build is a challenge to make interesting when going with the symmetrical route, it pushes for asymmetry. 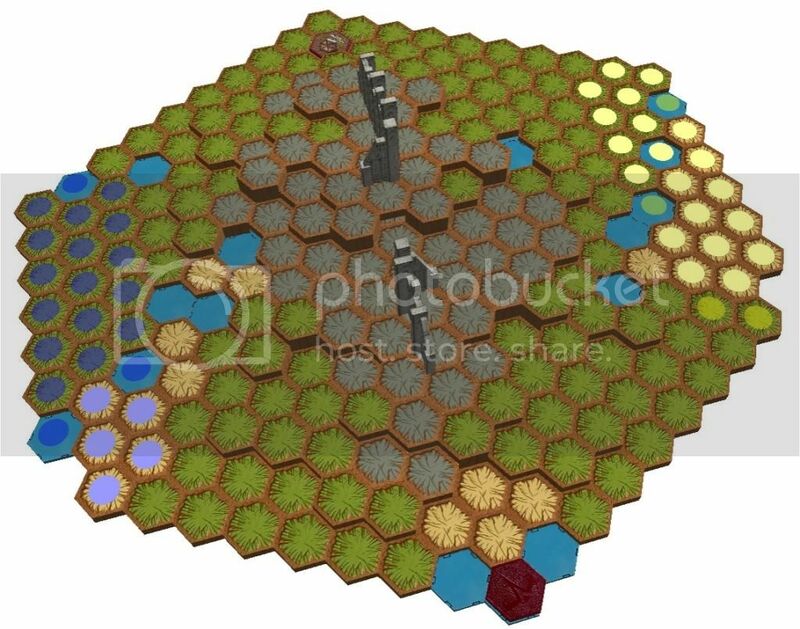 And I think asymmetrical maps are too scarce around heroscapers; they pretty much always are more of a feat to make balanced/competitive than perfect or almost perfect-symmetry, and for that, I think a lot of people are afraid to try to make them. They also seem to require more time in making, with them you can't just spit out a map and dub it "competitive" just because each side is the same in symmetry. It's always a treat to see them for me, I find them much more interesting most of the time. I also like that there's a random treasure glyph to the left, they're sometimes forgotten about. It reminds me of a mixture between GameBear's Common Ground and your Dry Season, both great 1 RotV maps. Again, cool map. When I finally get around to starting a map thread (right now my problem is I have a mac and am at college, I know there's a way to get windows on a mac but I'm not that great with computers and haven't tried getting it yet, I think I'm just going to wait and use my grandma's PC whenever I go home, then upload them from there), one of the first maps I'll post (I have 3 or 4 maps so far) is a 1 RotV map, can't wait to share it. I've spent a bunch of time crunching what people like and don't like about @GameBear 's single Rise map Common Ground and my single Rise map Dry Season, and this is what I've come up with. I really like Vallum...It reminds me of a mixture between GameBear's Common Ground and your Dry Season, both great 1 RotV maps. Again, cool map. Thanks, I'm glad you like it. And I'm glad to see you made the connection before you saw my intention. I must have succeeded at least a little bit. one of the first maps I'll post (I have 3 or 4 maps so far) is a 1 RotV map, can't wait to share it. Looking forward to seeing them, especially the single Rise. 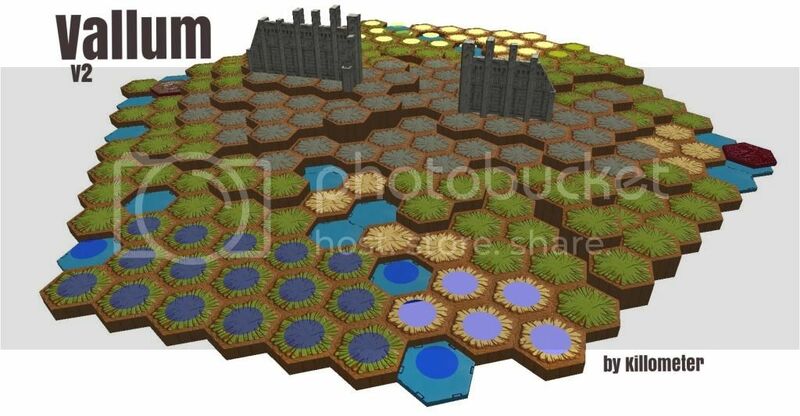 I've made some updates to Vallum. I shrunk the platforms on levels 4 and 3 around each ruin to make the real estate there more valuable, and expanded level 2 to provide more room to maneuver around them. I added a narrow bridge between the two hill to improve movement between them, but kept it small to keep the two hills tactically separated. I added a subhill to each side of the lower hill, to add a strong stance there to keep that part of the map attractive in the shadow of the taller hill. Finally I added some water to the edge of the map to push action in towards the hills. I've spent a bunch of time crunching what people like and don't like about @GameBear 's single Rise map Common Ground and my single Rise map Dry Season, and this is what I've come up with. To spice it up I've kept it superficially asymetric, but both sides have equal access to everything and play evenly. It has quite a bit of property on the highest level, but with the ruins cutting it in half it doesn't just become a plateau of slaughter. The power glyph is far enough afield to draw attention away from the tall hill (I liked it best with strong glyphs like Astrid, Gerda or Valda, but not enough to make it a fixed glyph), and the treasure glyph is easy enough to get to without decommitting from the high side that it tempts heroes (and I made the trap very low impact to avoid disincentivizing it, unlike some of my previous traps). The routes past the ruins are open enough that a single squad of Rats can't tie the whole thing up, and I've also accounted for hiding Rae-rae (Rise version can't cover the glyph from behind the ruin), and Zelrig and other ranged double basers can get to the top on OM1, but require a second OM to threaten the opposing SZ. I know there's more that I can't think of right now, but I'll fill it in as I remember. Looks very schmexy Killo. I particularly like the "mini-hills". I'll make sure to give it a whirl. Except now I have to rebuild it. I particularly like the "mini-hills". It took a long time for me to settle on where to put them. I kept trying to work them in nearer the tall hill, until I realized they'd go a great distance towards solving the problem you mentioned of the lower hill lacking draw. Now they're a good (but not great) Raelin/dragon/whoever perch over there: the gigh ground and glyph is too far for Raelin I to cover, and if you park a dragon or something similar there they cover a relatively limited chunk of map, thanks to its proximity to the SZ, ruins, and the edge of the map. And, as always, I'd love to hear how the updates play. Cool. I'll have to see if I can get a chance to build it. Thanks for keeping at these RoTV maps, Killo! If it sees some action and is well enough received mebbe I'll add it to your "must play" list. And just in case I forgot, belated thanks for your BoV-eye input on Dry Season; I considered it a lot when working on Vallum. Hey Killometer, how does Perilous Paradise play competitively (particularly for Heat of Battle)? "elvenwizard9." Now that's a username I've not heard in a long time. Sorry so slow to respond, elvenwizard. 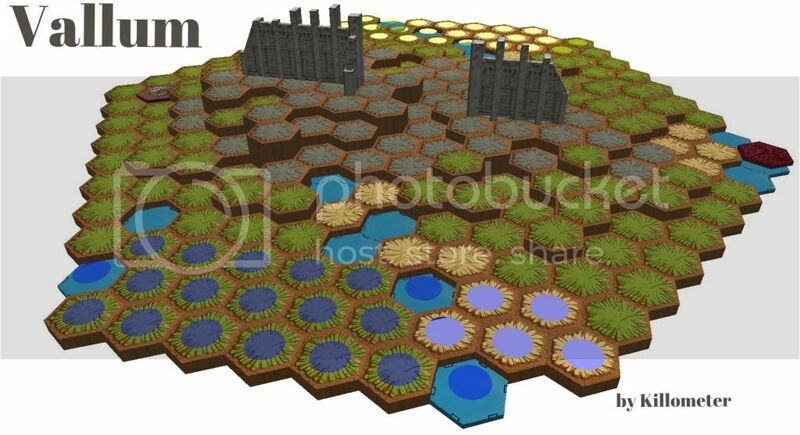 I've actually never played it as a HoB map, but I've played it a lot as just straight 1-on-1 kill 'em all, everything from 200 to 1000 points, and I'd be perfectly happy lining up on either side in a competitive format. Though as I consider it, in a HoB format its standard start zones might be dead zones-it's really designed as a clash-in-the-middle map, with a lot of interesting terrain and options there, with relatively plain SZ regions to allow rapid deployment. Possibly removing or adjusting the ruins and/or moving the glyphs out to there would help mitigate that. I'll dwell on it and let you know if I come up with any improvements for that format. Dunno. Requires more thought than I'm up for at 1 in the morning. Last edited by Killometer; August 1st, 2015 at 03:57 AM. I'll see how it plays - looking forward to getting it built this week!